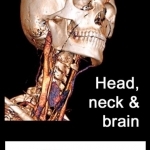 Go Anatomy’s Head, Neck, and Brain app attempts to continue the trend, and was created for medical professionals (from radiologists to students) or those interested in head and neck anatomy and neuroanatomy. The app is for use on iPhone/iTouch and claims to be useful in increasing anatomy knowledge and understanding. Would this be possible simply through an imaging app?